The atmosphere is jovial at the open house for Mount Saint Joseph Academy — Rutland’s Catholic high school. Feisty, white-haired alumni tend the grills inside the athletic association hut. The new principal, Sandra Wilkes, glad-hands with parents and teachers. Meanwhile, a volunteer is playing matchmaker with some of the new students. She steers one long-legged, wide-eyed teenager over to a pack of four veteran classmates, and a few moments later the five girls lope off across the outfield of Saint Peter’s Field. But the lightheartedness of the summer open house is balanced by a weighty reality: MSJ is desperate to attract more students. In its heyday, the high school educated as many as 600 students a year and earned more Division I football championships than any other school in the state, including rival Rutland High. Three years ago, enrollment had sunk to a mere 65 students, almost a tenth of what it once was. The numbers have inched back up slightly as a result of recruitment efforts, such as this one, on the part of parents, teachers and alumni. Around 80 “Mounties” were scheduled to show up for the first day of school — which has MSJ boosters breathing a bit easier than they were a few years back, when a letter from the diocese handed down an ultimatum: Cut the budget or close the school. School board chair Peter Giancola admits the looming threat “lit a fire under us.” The school board slashed $100,000 from the school’s operating expenses, and today MSJ is still fighting tooth and nail to stay in the game. In a state where declining student enrollments threaten the future of both public and private schools, the Catholic high school faces the added challenge of convincing families that a faith-based education — to the tune of $5900 a year — is a worthwhile investment. That would include college scholarships totaling $1.3 million bagged by the 24 graduates in the class of 2012. For three out of the last four years, 25 percent of the senior class at MSJ passed the college-level Advanced Placement calculus exam. Harder to quantify: MSJ appears to be a close-knit community, in which everyone’s related, or darn close to it. The August barbecue feels more like a family reunion than a school function. Instead of the usual bellyaching about small towns and smaller schools, the students talk up their tiny classes and many friendships. “I love it,” says junior Grace Giancola, the daughter of the school board chair. “You’ve got to be friends with everyone because you can’t avoid anyone,” says her pal, senior Shea McGee. Read the rest of this story in the September issue of Kids VT. 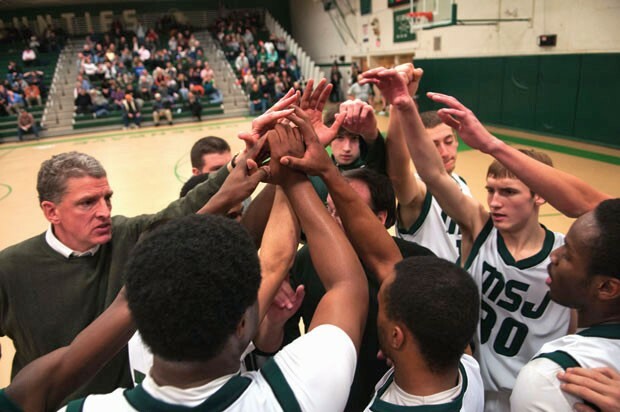 The Mount Saint Joseph's basketball team plays a home game against Brattleboro High School.